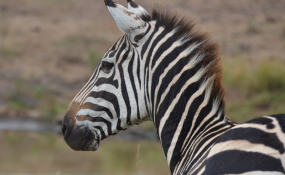 Two suspected poachers were arrested on Friday in the Zambezi region for being in possession of zebra meat without a permit. Zambezi regional control warden Morgan Sai-Sai said on Friday during a media briefing that the arrests came after they received a tip-off, and went to investigate. "Early morning around 06h00, we got intelligence regarding poaching in the Salambala Conservancy. We went there with members of the protected resources sub-division, the police and manpower from the Special Reserve Force to investigate. When we got there, we found that the suspects were not at home, and the neighbours informed us that they went into the field. However, in their house, we found the head of the zebra, some meat, and also two firearms we suspected were used to poach the zebra. We then decided to follow their trail, and it led us to the Izimwe village, where we discovered that they were storing the other meat at someone's house. We arrested the owner of the freezer for the illegal possession of game meat," he explained. Sai-Sai noted that they went to the police station to open a case, and while they were busy, they were informed that the other suspect had returned home, and managed to arrest both. "They even gave some of the meat on account to elders in the village, who were supposed to pay when they get their grants at month-end. But we confiscated the meat, although we did not arrest them as they were very old. In this Salambala conservancy, we still experience escalated cases of poaching, and in the region overall, we know that poaching is recurring and prevalent. However, we want to caution and urge our communities to refrain from indulging in such activities," he stressed. He said citizens should regard game as their own resource, which they can use to improve their lives, and for rural development as well as employment-creation. "We have realised that these days, people are poaching for commercial purposes; it's no longer for personal consumption. So, you can see that escalation can lead to the extinction of wildlife," he added. Zambezi regional police spokesperson, inspector Kisco Sitali, told The Namibian that two male suspects were also arrested on the same day in Kongola for being in possession of four elephant tusks. "The two Namibian suspects, aged 26 and 42, are in custody, and the four elephant tusks were recovered. The suspects will be officially charged today, he said.